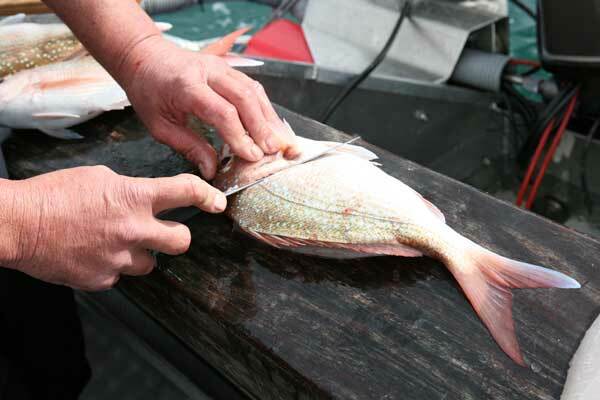 Usually when filleting a fish the second fillet is harder to remove from the fish than the first. 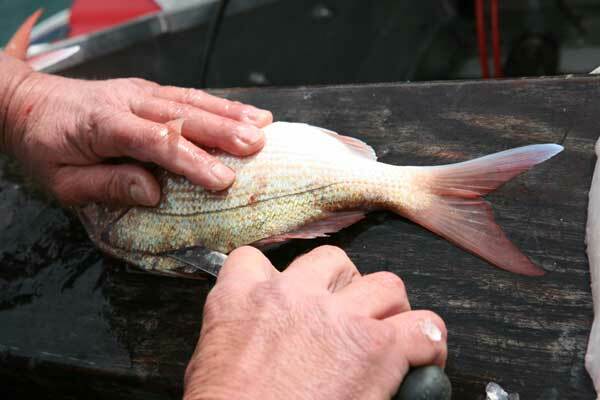 The technique shown in the pics below is an easy way to learn how to filet fish because the first fillet is not completely removed. This way the fishes backbone does not collapse on the other side. The fisherman doing the demonstration is one of the guys from our shop. If there is anything you don't quite understand drop in and have a chat with him. Geoff Thomas took the great pics and a video. Keep an eye on his "Outdoors Show" to see the video footage. A good cleaning fish tool box consists of a fillet knife which is not too long - a six to seven inch blade - and he recommends rounded tip knives as the best fish filleting tool. 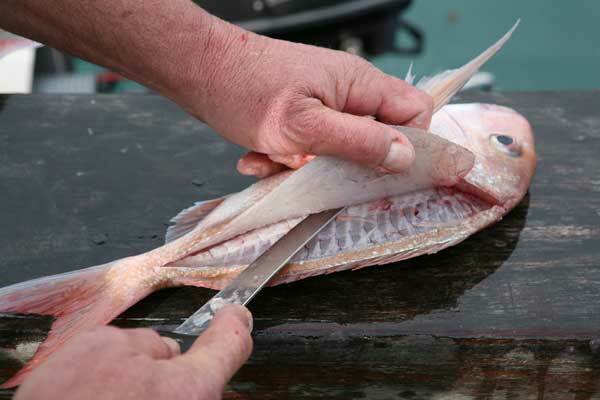 We prefer Victorinox or White Lux knives for filleting and a longer blade for skinning fish. For sharpening we use a knife steel in preference to the ceramic or tungsten vee shaped knife sharpeners which remove a lot of metal from the blade. When the blade is too dull for the steel to sharpen we use a whetstone to bring the edge back. We recommend you always wash and steel the knife before storing safely back into the sheath. Novices should learn how to fillet a small fish before trying anything too big. 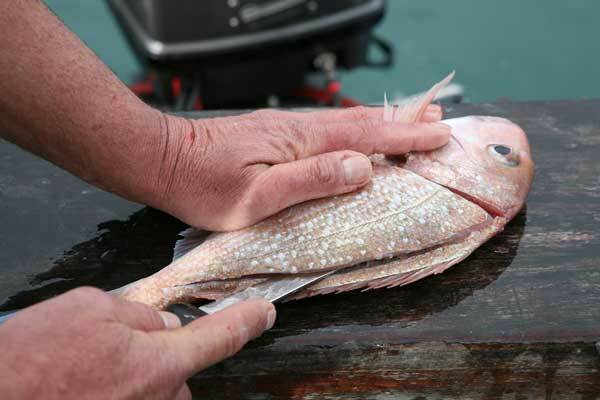 The fish below were caught midwinter on PFK Boat Longlines around the David Rocks in the Hauraki Gulf. First cut behind the head while angling the knife toward the front of the fish. There is a lot of good flesh on the top side where the fillet extends under the bony plate of the skull and angling the knife will ensure you don't waste it. Cut down to the bone and follow the line through to just behind the fins on the gut cavity. Turn the fish and run the knife just clear of the fins with a slight downward angle. When you feel the knife is down to the bone reduce the angle and follow the bone until you come up against the backbone. 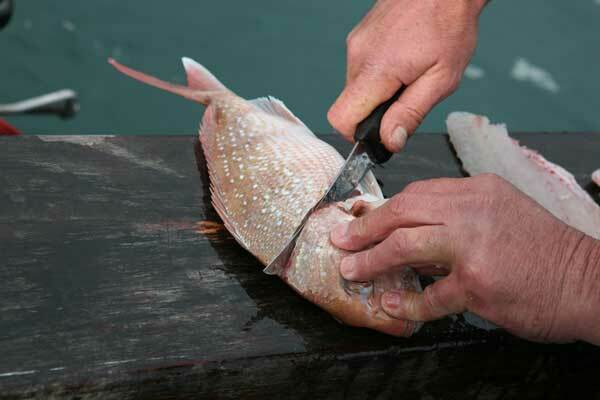 Peel the filet back and run the knife over the backbone severing the small lateral fish bones in the process. Stop at this point. Repeat the second cut near the dorsal fin with the knife angled slightly down. While the team at PFK have firm preferences, many fishermen have their own favourite knife. Some prefer high quality custom filet knives while most are happy with off the shelf fillet knives. The main thing is to select one that is comfortable in your hand and, keep it sharp! It is also a fact that cheap knives will often require more downtime for sharpening to keep a decent edge on them.